The Building Blocks for the New-Era Business rolls on. Last year in the summer we released a free copy of our beta version of the financial model – we got a few bites and got some solid feedback – overall it was well received, driving us to make it better. In this post we are going to roll out the financial model and look at how to use it as part of the planning process for the new-era business. The financial model has always been the most daunting part of the planning process for most people. In addition to having to create revenue and expense forecasts, you have to mess around with Excel and factor in tax and other accounting principles. That’s why we created a comprehensive financial model that has all the components – cashflow, income statement and balance sheet – which can be manipulated and updated with minimal effort. Why should you create a financial model? When you are planning a business, there is always a (usually high) degree of uncertainty as to when the cash will start to flow. For this reason, it is good to have a tool that allows you to forecast when the revenues will start to roll in and how much money you will need to spend in the process to get there. Our financial model allows you to predict and continuously update the assumptions that underpin the financial performance of your business with great flexibility. The other reason to have a financial model is because you might need it if you want to present your business to investors or other partners. What people will want to see is that you have a good idea of how much the company will need to spend in the early phases (cash burn) in order to reach a level where cash coming in the door is greater than cash going out (cash positive). Finally, a financial model can simply be used to play around with new ideas and test out certain business models. How does a financial model work? The photos in the model above are from the original financial model. 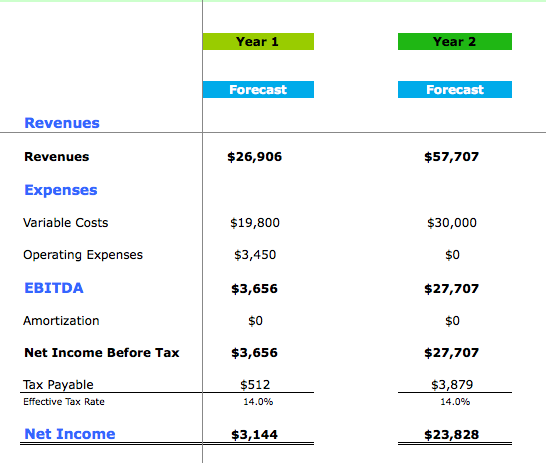 While the new, simplified version of the model has all of the same components and look as the original financial model, it has one extra page (pictured below) to make it simpler to create quick forecasts. The model has the basic financing, tax and SR&ED (for Canadian technology companies) capabilities built in. The tax rates can be modified to suit different countries (Canadian tax rate are used now), assuming the overall structure is the same (ex. the UK is quite similar) – if the tax structure is quite different, we would need to chat about what adjustments need to be made first. 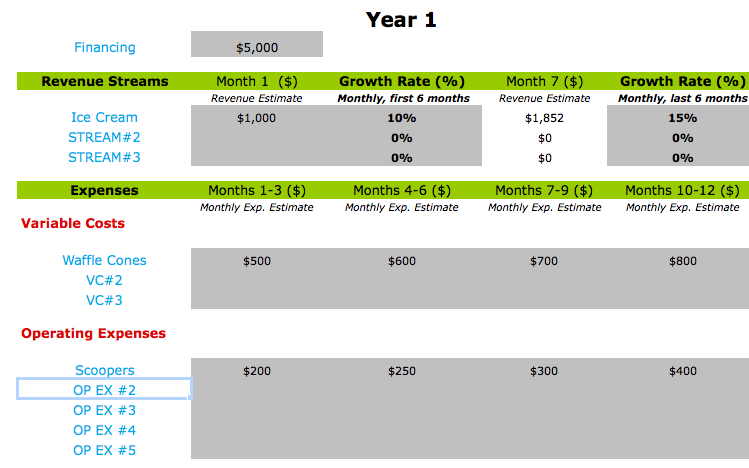 Overall, the idea is that you want to create a snapshot of your company’s future finances, one that you understand in depth and present to other people. The financial model is directly integrated with the business model because you need to be able to establish that your business model is both viable and sustainable. If you come up with a business model that you think is brilliant, yet you are not sure if there is enough of a market to justify the expenditures, the financial model will help you determine the answer.